Brian Redmond, head of archaeology at the Cleveland Museum of Natural History, holds a spear point found at a 4,000 year-old site in Sheffield Village. Around the time Stonehenge was being built in England, native peoples here in Ohio were building more humble structures. 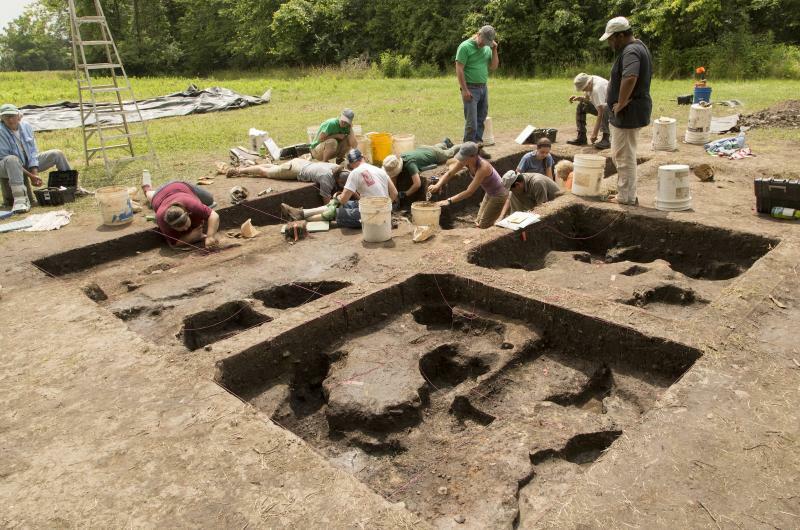 But an excavation this summer of an ancient settlement in Sheffield Village shows that early Ohioans lived pretty comfortably here 4,000 years ago. In this week’s Exploradio, WKSU’s Jeff St.Clair looks at how a first-of-its-kind discovery is shedding new light on archaic Ohio. The stately Burrell homestead was built in 1820. It’s one of the oldest buildings in Lorain County. But nearby, in what was once the estate’s orchard, are the remains of much older habitations. “This is a 4,000 year-old house floor,” says Brian Redmond, head of archaeology at the Cleveland Museum of Natural History, pointing to a smooth patch of yellow clay. Redmond and his team led digs this summer that revealed ancient living spaces buried beneath this grassy field. He points to a neatly dissected pit. Clay floors like this have been found farther south in Kentucky or parts of Illinois, says Redmond, but never before in Ohio. The floor was enclosed by an oblong shaped house. He points to a series of dark patches around the floor’s edge. Just outside the house Redmond and his crew found a pile of deer bones -- perhaps the remains of a stew pot -- plus nutshells and several stone tools. But inside – not much. “People swept their floor,” he says. But he did find one special item inside the house, buried in a shallow depression. Redmond had found part of a bannerstone. It’s a diamond-shaped piece of slate with a hole drilled down the middle. 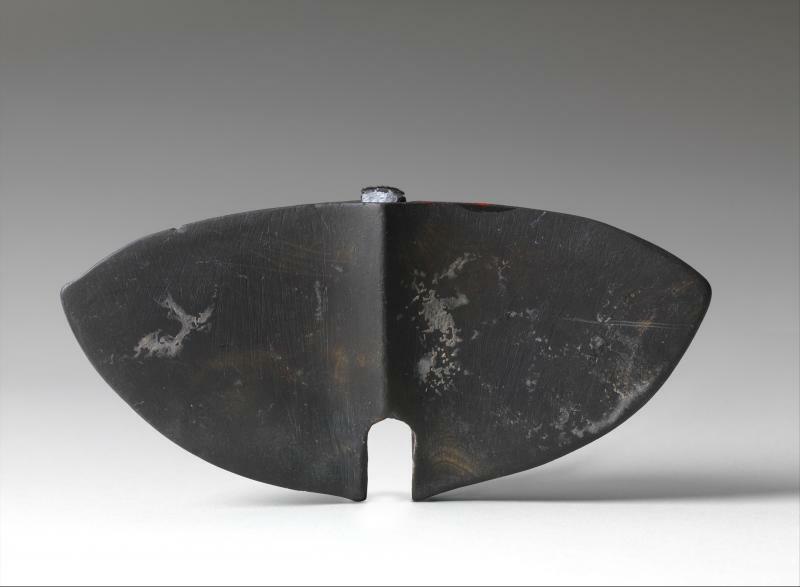 It was used as a counterweight for an ancient spear thrower or atlatl. He thinks this one was ritually broken and buried beneath the floor. Back at the museum, Redmond shows me the artifact itself. 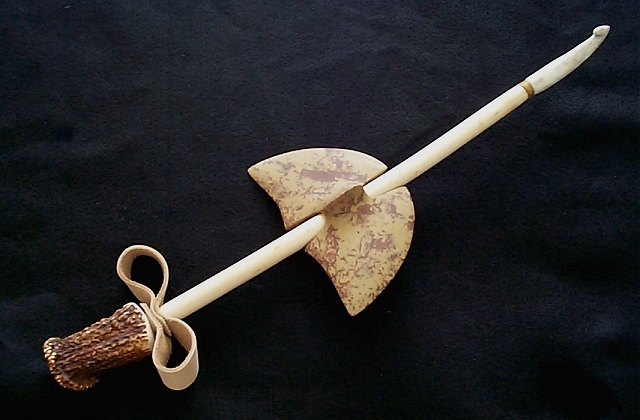 Before bows and arrows arrived in Ohio, people used spears and spear throwers to hunt game. The bannerstone helped hold the spear steady, but Redmond says its artful design and ritual burial show it meant more. Of all the periods of Ohio’s prehistory, the 7,000 year stretch known as the archaic, from 8,000 BC to 1,000 BC, is the least understood, according to Kent State anthropologist Linda Spurlock. People were starting to live in one place for longer periods, like at the site in Sheffield Village. “People are settling into areas and learning to extract a living very carefully from the local resources,” she says. Back at the site, Redmond is digging another test pit. He says the dirt all around us contains relics of ancient habitation. But archaeologists hesitate to call such a grouping of homes a 'village." Instead he calls it a "seasonal base camp." In fact, Redmond says archaic people lived here off and on for at least 500 years, primarily during the fall and winter months, living off the land with plenty of hickory nuts, deer and fish from Lake Erie and the Black River. But there was no corn; that Native American staple hadn’t reached Ohio yet. Neither had pottery. Volunteers at the museum are cataloging the dozens of stone tools, animal bones, and other artifacts found at the Burrell Orchard site.